Jean Hasbrouck House (ca. 1721), Historic Huguenot Street, New Paltz, NY. Photo by Pieter Estersohn, 2017. Courtesy of Historic Huguenot Street. NEW PALTZ, NY (October 6, 2017) – Historic Huguenot Street has on display over a dozen American and Dutch kasten (singular: kast), or Dutch-style cupboards, from the museum’s Permanent Collection and selected loans, throughout the Jean Hasbrouck House (ca. 1721) and Abraham Hasbrouck House (ca. 1721 through 1741) through December 17, 2017. The exhibition is incorporated in Historic Huguenot Street’s general tours, and three special-focus tours that will be held Saturday, October 14 (3 pm), Thursday, November 9 (3 pm), and Saturday, December 16 (2 pm). Special tours are $20. Advance registration is available at huguenotstreet.org/kasten. Originating with the Dutch, the kast is a furniture form popularly adapted in New York’s Hudson Valley. Although variations exist, the typical kast is a large, free-standing cupboard or wardrobe with two paneled doors surmounted by an over-scaled cornice. The cupboard usually sits on a base with a single drawer or drawers and ball-shaped feet. Some simpler versions made by country craftsmen feature cut-out or stylized feet and may or may not have drawers. 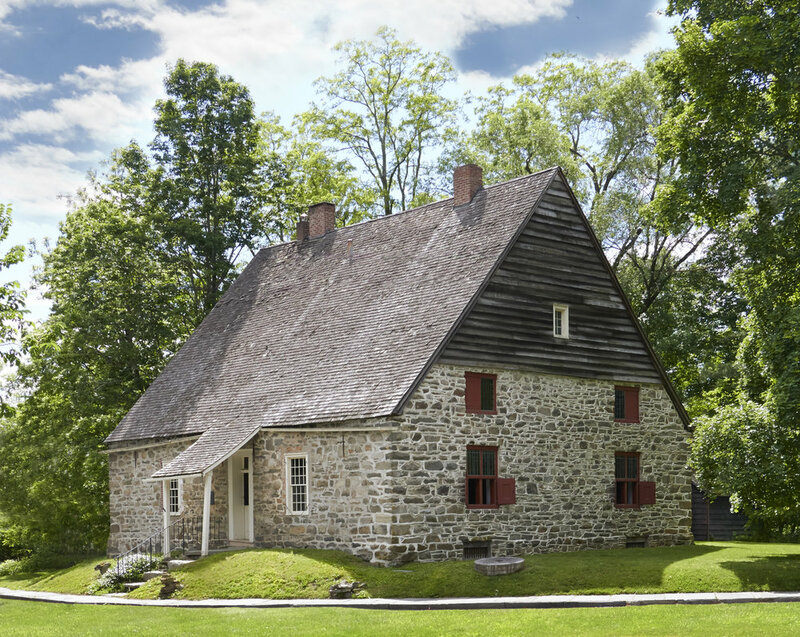 “Kasten are known to have been made exclusively in New York, New Jersey, and coastal Connecticut beginning in the early colonial period and continuing, at least in the Hudson Valley, through the 18th century and into the early years of the 19th century,” explained Sanford Levy, Historic Huguenot Street Vice Chairman. Installation of kasten at the Jean Hasbrouck House, showing left to right a “country” kast on loan from Jeffrey and Sue Hoffman and kasten from the Historic Huguenot Street Permanent Collection and the Reformed Church of Kingston. Photo by On Location Studios, Poughkeepsie, NY, 2017. Historic Huguenot Street houses one of the largest collections of Hudson Valley kasten in the nation. This exhibition, Kasten from Mid-Hudson Valley Collections, gathers these unique cupboards from several prominent regional public and private collections, including the Friends of Historic Kingston, the Hasbrouck Family Association, Ulster County Historical Society, and the Reformed Church of Kingston. A Dutch-made kussenkast (ca. 1650) with connections to the Elting family and Huguenot Street is on loan from the Historical Society of Newburgh Bay and the Hudson Highlands. “Kasten were central to domestic life in colonial New York. While serving a utilitarian function as the primary storage for linens, these impressive pieces were quintessential to the furnishings of Dutch-American homes, signifying the heritage of the owners as well as their wealth and social status,” said Josephine Bloodgood, Historic Huguenot Street’s Director of Curatorial and Preservation Affairs. The exhibition provides perspective on the influence of Dutch culture in the early Hudson Valley, especially when viewed alongside the accompanying exhibition, Living in Style: Selections from the George Way Collection of Dutch Fine and Decorative Art. A full-color catalogue of the exhibition will be released in January 2018, and made available at the Museum Shop, in-store and at huguenotstreet.org/shop.